My favorite holiday memories are usually never the big parties or crowded shopping malls. What I love the most are the little moments of the season….watching Christmas movies with friends and family, baking cookies all night long, or sipping hot cocoa by the fire. 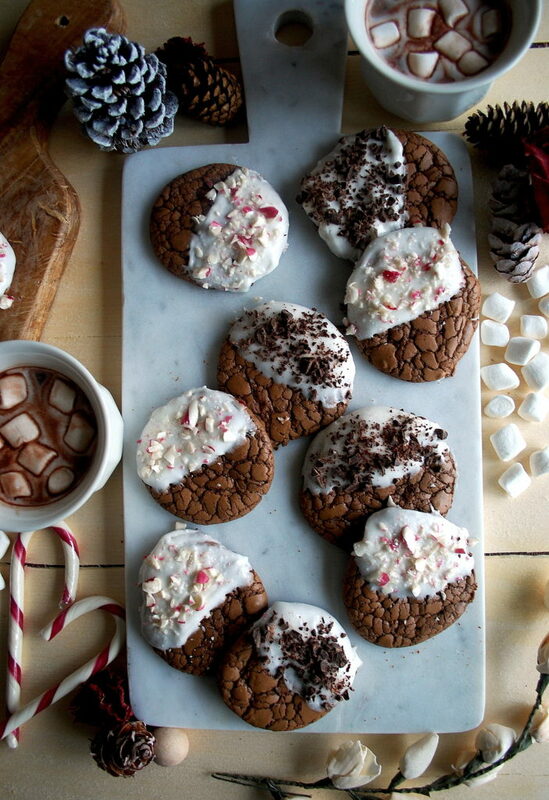 These cookies combine the wonderful hot cocoa combination of chocolate and marshmallows. It’s a really simple chocolate cookie recipe that results in slightly crisp edges and an irresistibly chewy inside. I use both cocoa powder and melted chocolate for a really intense chocolate flavor. 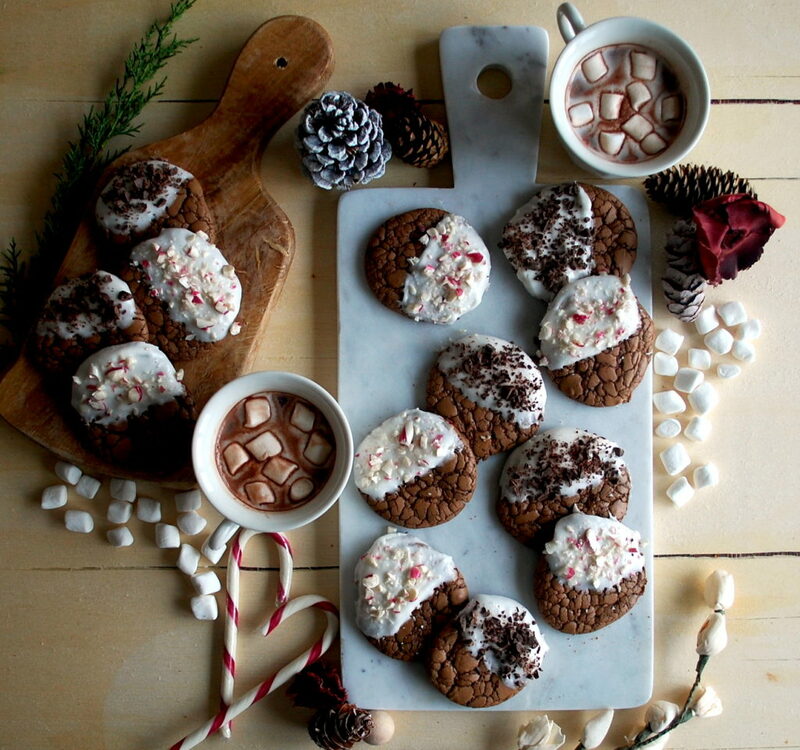 I played with adding the marshmallows to the cookies in a few different ways. After scooping out the cookies onto a baking sheet, I pressed a few marshmallows right into the raw dough. 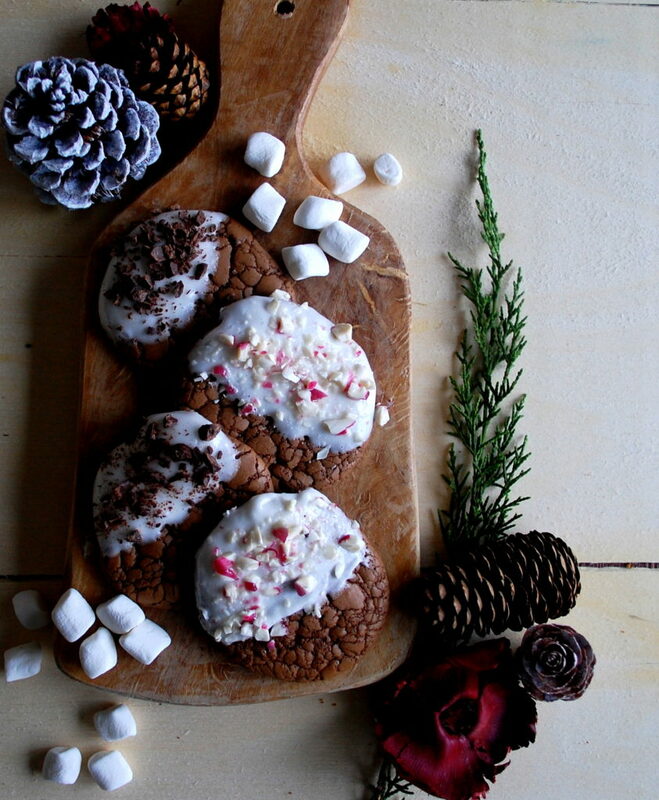 As they baked, the marshmallows cooked into the cookie. While these tasted great, I wasn’t too happy with how they looked. I finally decided to just melt the marshmallows down so that I could dip the cookie right into it. Make sure to melt them over a double boiler (a mixing bowl placed on top of a small saucepan of simmering water) so that they melt slowly and do not burn. The mixture became sticky so I used a spoon to help coat the cookies. The trick is to work quickly because as soon as the marshmallows cool down, they become really thick and clumpy. After glazing each cooking with the melted marshmallows, sprinkle your topping on right away so that it will cool into the glaze. 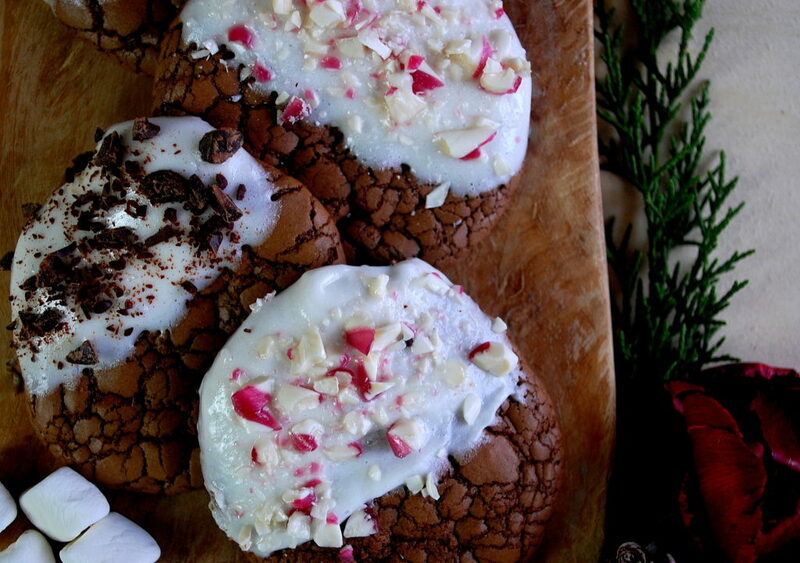 I used shaved chocolate and some crushed candy canes, which really made the cookies look beautiful. You could also try chopped nuts, sprinkles, or even coconut flakes to change up the flavor. 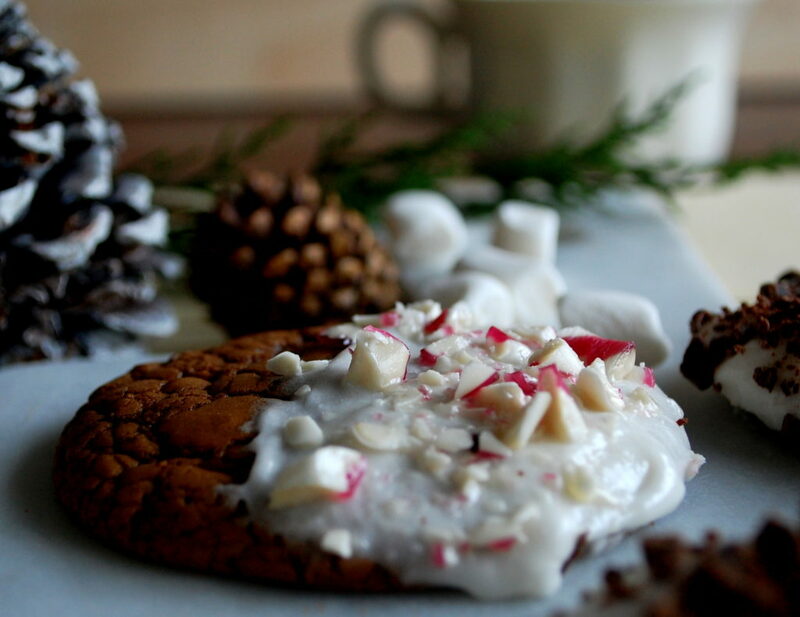 No matter what, you’re bound to have a tasty little cookie that reminds you of the classic winter drink. And even though the cookie has all of the flavors, I like to dip them in a mug of warm hot cocoa, too. Enjoy! Preheat the oven to 375°F. Gently melt the chocolate over a double boiler or in the microwave. Set aside to cool. Using an electric mixer, cream the softened butter and brown sugar together until smooth. Mix in one egg at a time. Add the vanilla and cooled melted chocolate. Mix to combine, scraping down the sides of the bowl as needed. Sift the flour, cocoa powder, baking soda, and salt together in a separate bowl. Slowly mix in half of the flour mixture on low speed. Scrape down the sides of the bowl. Mix in the rest of the flour mixture. Increase the speed to fully incorporate all of the ingredients. Once the dough comes together, refrigerate it for about 20 minutes so it’s easier to work with. Use a spoon to portion out the cookie dough onto a baking sheet, about 1-2 tablespoons per cookie. Bake the cookies for 10-12 minutes. Transfer the cookies to a cooling rack. Combine the marshmallows and water in a double boiler. Slowly melt, stirring often so that the marshmallows do not burn. After a few minutes, the marshmallows should have melted down to a silky smooth glaze. You can adjust the consistency with more or less water. Work quickly to coat half of each cookie with the glaze. 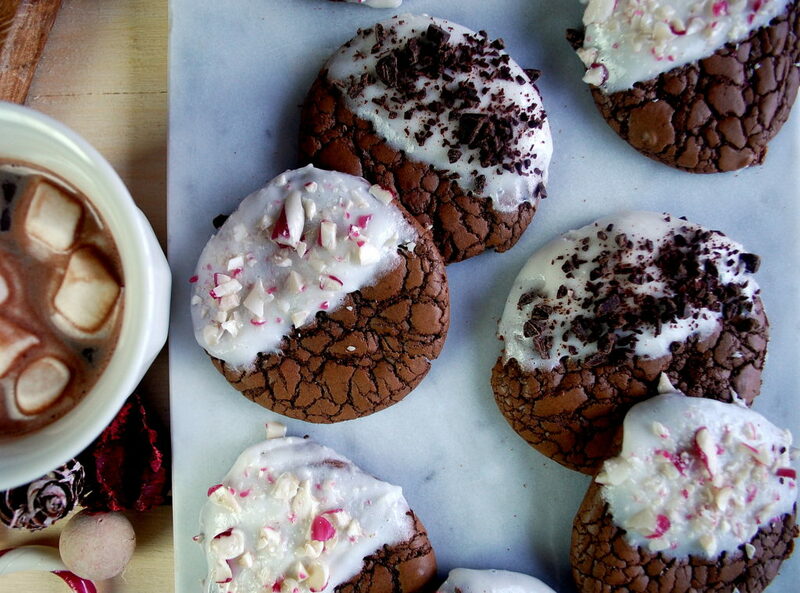 Immediately sprinkle the toppings onto each cookie. Let cool before serving. If the marshmallows clump up and become too thick to work with while coating the cookies, return the bowl back to the stovetop over the simmering water. Add a touch more water and let the marshmallows re-melt before continuing to glaze. Loooove your featured photo at the top! Awesome food styling! Thank you! I really appreciate the great feedback!